This article is about a minigame in Mario Party 4. For information about the gameplay element that signifies the end of a level, see Goal. GOOOOOOOAL!! is a 1-vs-3 minigame in Mario Party 4. It is also featured in the minigame compilation game, Mario Party: The Top 100. Its name is a reference to the prolonged 'o' heard when excited sport commentators observe a tension-breaking goal from a soccer player. The game is set on a soccer field with the solo player as the goalie. The three players run into the picture and get their soccer balls. They turn towards the goal and the game begins. The goal for the team is to kick ten soccer balls into the goal within thirty seconds. However, the solo player tries to defend them in order to win. If they fail to kick ten in, the solo player wins, regardless of how many goals under ten the team made. If the team kicks ten balls into the goal, they win. 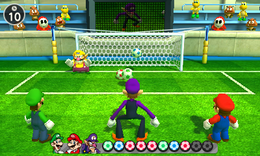 After the game is over, the winning side is shown on the soccer field's jumbotron in Mario Party 4. If the solo player wins, they will do their victory pose while the three players sulk in disappointment. If the three players win, they will do their victory poses while the solo player sulks. Game Rules – "One player is the goalie! Protect the goal from the team players' shots. Get ten goals to win!" Advice – "The goalie must move left and right effectively and even dive to protect the goal!" Description: "Be the kickers and go for the goal, or be the goalie and block those shots!" On-screen (Goalie): "Don't let your rivals make 10 goals!" On-screen (Kickers): "Make 10 goals!" Gōru Gōru Gōru! Goal Goal Goal! This page was last edited on December 27, 2018, at 16:12.